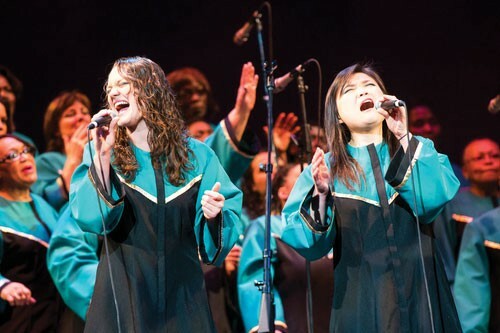 The Oakland Interfaith Gospel Choir performs at the Green Music Center's Weill Hall on Feb. 1 at 8pm. 1801 East Cotati Ave., Rohnert Park. Free (tickets required). greenmusiccenter.sonoma.edu. BELT IT OUT The Oakland Interfaith Gospel Choir may not look traditional, but the music is the real thing. The Oakland Interfaith Gospel Choir's Terrance Kelly isn't coming to Sonoma County this week to save souls per se—but the choir's artistic director says he hopes to lift some local hearts in a region reeling from the October fires. Formed in 1985, the OIGC is a multicultural choir that draws from persons of all races and faith—or of no faith—to deliver a one-love message that's powered by slave songs and gospel music. The choir performs at the Green Music Center on Feb. 1. They've come off tour recently with the San Francisco Gay Men's Chorus, one of whose members lost a home to the fires. Kelly vividly recalls the moment. "There were 287 gay men's chorus members and around 47 of us. When this guy found out he lost his home, everyone was crying. We asked him, 'Do you need an emergency flight home?' He said, 'No thanks.' We stayed out and finished the tour." In a divided America oversensitized to questions around identity politics and cultural appropriation, the OIGC provides a bracing and uplifting rejoinder that's set in the granite of authenticity. Kelly is not so nearly concerned with questions of appropriation, he says, as he is with his choir singing the black gospel the way it's supposed to be sung. "We don't take it and make it something else," he says. Kelly has heard from many older, black audience members who come to him after OIGC performances, amazed at the fidelity of the encounter with music forged in human suffering. "When we get that response," says Kelly, "we know we are singing authentically." We're living in trying times, says OIGC executive director Mark DeSaulnier—all the more reason to get on the good foot with Jesus, or at least the music sung in his name and created in the crucible of slavery. The administration in Washington, he says, "has created divisions, so to speak, of inclusion—no matter your skin color, socioeconomic situation, no matter your sexual orientation, we can stand together and we can celebrate our differences." The beaming, belt-it-out authenticity on display at the OIGC springs in part from a sense of shared pain that's not the provenance of one or another faith or group of people, says DeSaulnier. "One of the core messages in black gospels and spirituals," he says, "which is relatable at any given point, is that we all have adversity and hardship. And people want to be reminded of that. They want to be in a community that lives it out." Correction: An earlier version inaccurately reported that OIGC was founded in 2013. That's the year the choir formed a new community choir.